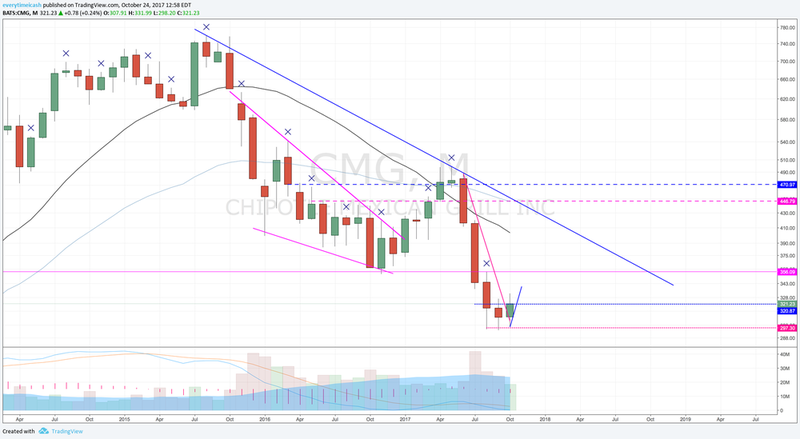 Chipotle (CMG) is set to report Q3 earnings after the close today (last quarter the co reported at 16:10). The co will host a conference call to discuss later at 16:30. On October 20, RBC lowered tgt to $330 from $440. 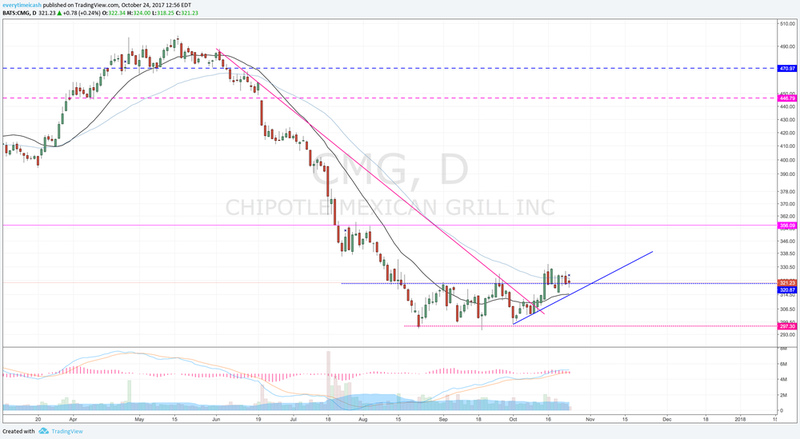 =CMG has recently held a base near 300 after the stock broke free from a downtrend started back in June. The stocks margins and foot traffic will remain a concern going into the quarter. If it can hold its trend above the 20D (315 area) momentum should remain on its side for further gains. If the stock breaks however, my next area of interest will be the 265 level. Reports Q3 (Sep) earnings of $1.46 per share, ex-$0.64/share in data breach costs but including $0.13/share from hurricane impacts, $0.32 worse than the Capital IQ Consensus of $1.65; revenues rose 8.8% year/year to $1.13 bln vs the $1.14 bln Capital IQ Consensus. Comps +1% vs. +1.4% estimates. Food costs were 35.0% of revenue, a decrease of 10 basis points as compared to the third quarter of 2016. The benefit of the menu price increases taken in select restaurants during the second quarter of 2017 and decreased paper cost and usage were offset by higher avocado and beef prices, as well as steak making up a higher portion of our product mix compared to the third quarter of 2016. Restaurant level operating margin was 16.1% in the third quarter of 2017, an improvement from 14.1% in the third quarter of 2016. The improvement was driven primarily by decreased marketing and promotion expense and labor efficiencies. For 2018, management expects: 130 to 150 new restaurant openings.